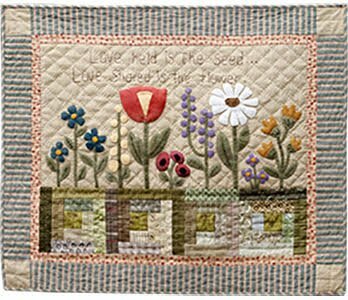 "Love held is the seed ... Love shared is the flower" Mixing regular piecing of log cabins with wool applique brings this charming wall hanging to life. Simple pleasures abound while you learn the techniques for wool applique. Kit available includes cotton and wool for the top. The log cabin blocks are pre-cut. Cost for kit is $44 payable to the teacher. Cost for kit is $44 payable to the teacher. Kit available includes cotton and wool for the top. The log cabin blocks are pre-cut.